Our nation’s Founding Fathers - were geniuses. 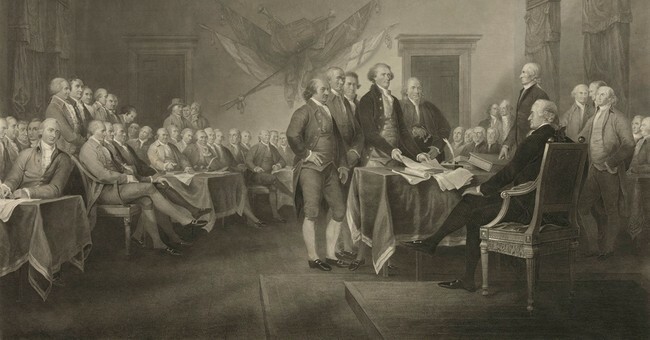 They overcame the unbelievable handicaps of being white, male and by nigh all accounts all heterosexual - to create the greatest form of government in the history of personkind. Amongst their very many brilliances - was federalism. The concept of a very limited federal government with expressed powers - leaving the unexpressed and all the rest to the states and the people. The Ninth and Tenth Amendments to our Constitution help lock down this federalism. The Founders knew they weren’t perfect (though they came exquisitely close). Their federalism allows states to experiment with new ideas of how to govern. And if the citizens of one state don’t like what that state is doing - they can move to another. Yet another Founder deference to the governed. The Left, of course, loathes federalism. Nationally syndicated radio host Chris Plante rightly observes that the Left wants to mandate that which they do not want to ban - and ban that which they do not want to mandate. The Left can not mandate or ban things - when you have states routinely going all federalism rogue. So you need to centralize power as much as possible in the federal government - which means the Constitution and federalism have to take a flying leap. And one additional of the very many ways the Left expresses its loathing of federalism - is by bizarrely warping its definition. Things that belong to the states and the people - because they aren’t enumerated in the Constitution - are claimed by the Left to be the purview of the Feds. And things that are per the Constitution expressly the Feds’ purview - are claimed by the Left to be a matter for the states. This isn’t federalism - it’s Bizarro federalism. Of course, nowhere in the Left’s calculations are We the People a consideration. The Left will ignore or cite federalism - whenever and wherever. So long as whatever they claim - increases the power of government somewhere. There are a panoply of federal departments, agencies, commissions and boards dedicated to things that - per the Constitution - belong in the hands of the states and the people. In the interest of time, we shall instead examine two instances where the Left takes demonstrably federal issues - and tries to claim “Federalism!” to allow Leftist states to violate the Constitution and our laws. Because they do not like what the federal officials We the People elected are doing about them. One is immigration. This is so obviously a federal government issue. If Canada were to invade via Montana (I will pause to allow the laughter that concept will invariably cause…) - it is not solely the responsibility of Montana to repel the invasion. Our national sovereignty has been violated - because our national borders have been violated. Thus a national response is required. When the Japanese bombed Pearl Harbor - we didn’t leave Hawaii to fend for itself. We the People have elected a lot of federal officials to pass a lot of immigration laws. Which are inordinately generous on legal immigration (one million immigrants per annum) - and quite reasonably require the expulsion of illegal alien invaders. We even passed a law to build a southern border wall - in 2006. Which ain’t exactly going well, as we know. But Leftists don’t like enforcing our borders. They don’t like the nation - so defending its sovereignty isn’t a priority. In fact - violating it is. Illegal aliens cost tons of government coin - which means they grow government. So the Left loves them. The Left loves illegal aliens so much they go out of their way to violate the Constitution and our laws - by creating “sanctuary” cities, counties and states. Where they steadfastly refuse to enforce the laws our federal elected officials have passed. Another example of this - is the World Wide Web. It is, after all, a World Wide Web. Which means our sovereign nation quite obviously should have one federal slate of Internet policies - and our federal government should negotiate terms for international Internet interaction with the rest of the planet. The Donald Trump Administration - is far-and-away the most government-reducing administration since at least Calvin Coolidge. So of course the Left loathes it and him. One of Trump’s very many great policy moves was undoing the Barack Obama Administration’s massive Internet power grab - disingenuously executed under the banner of Network Neutrality. The Left has spent every single second ever since - freaking the heck out. And yet again executing one of its go-to moves: Ignoring rightly-federal law - by looking to establish big-government-sanctuary-enclaves all around the country. The Commerce Clause was - like all of the Constitution - a government-limiting entry. It was written to prevent states from big-government-imposing barriers to interstate commerce. Let us for now ignore the Feds’ overreach in regulating “the products themselves…(and) the process of creating those products. Bits on the Internet - criss-cross state and international borders hundreds of millions of times a second. To think that a single U.S. state here or there has the prerogative to regulate something that is so obviously a Commerce-Clause-federal-responsibility - is warped, ideological nonsense.